"Something different! These are great as appetizers or snacks! I make these for a meal! Kids love them!" Heat a large skillet over medium-high heat; cook and stir ground beef until crumbly, evenly browned, and no longer pink, 8 to 10 minutes. Drain and discard any excess grease. Stir in Cheddar cheese and onion soup mix. Divide crescent roll dough into triangles along perforated edges. 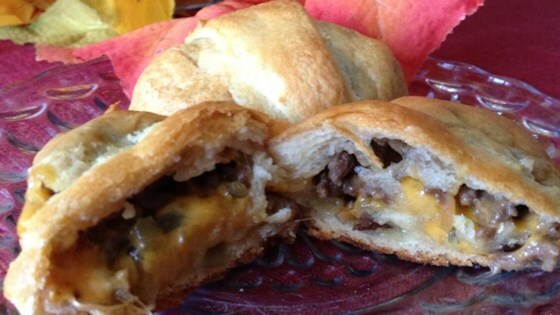 Place 1 tablespoonful beef mixture onto each triangle; roll dough over meat and transfer crescent rolls to a baking sheet. Bake in preheated oven until golden brown, about 15 minutes. Hot little sandwiches and cool pasta salad pair perfectly. These were easy and tasty! My son compared their flavor to a White Castle Burger. I will make again! I think an entire package dry onion soup mix is too much for 1/2 pound of ground beef. Otherwise these are terrific. I added a small amount of dill relish on top of the burger mixture. Thanks!